It is not everyday that you find someone who inspires you in so many ways. 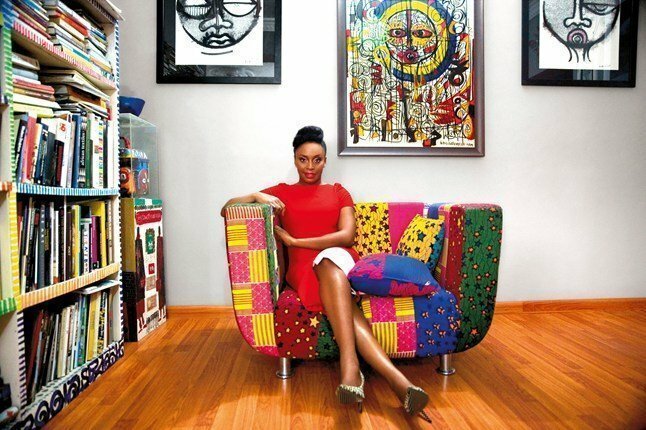 As a girl, a writer and a female Nigerian, Chimamanda Adichie is a role model of what I aspire to be everyday. Although there are so many Nigerian women that I admire, it is rare for me to find one that embodies a lot of the things I believe in and wish to be. But in Chimamanda Adichie I found one. It was a great pleasure for me to see she will be gracing next month’s pages of Vogue, with a stellar interview conducted in Nigeria. Now not only will more people be ‘aware of’ and an ‘audience’ to her amazing talent. But also it is nice to see someone very relatable to me in a magazine that I admire and love reading. My Introduction to this Literary Genius! I remember the first time I found a “Chimamanda Adichie Book”, I was 13, an impressionable stage in my life and I had an insatiable fervour for books. I read every novel I could lay my hands on, be it from the library or my local bookshop. But in this case I found a copy of “Purple Hibiscus” at my cousin’s house. What started off as a glance through the book ended with me absorbed in it and reading the entire book in 2 days and enjoyed reading it. But was startled by certain parts of the book and the extent of the cruelty the father character did to his family. (More on that in the book review which I will upload very soon). Fast forward to a few years later, I was a 16-year-old college student who still had her love for books. I met this boy in my A’Level class and we became chummies. We talked about everything including books and one time he mentioned “Half of a yellow sun” to me and when he told me the author, I instantly recognized her—she does have a unique name. He lent me his copy of the book and in between classes and every spare time I had, I read the book. I remember reading the last page and running to find him because I couldn’t wait to discuss it. Prior to reading the book, I had no knowledge of the Biafran war which is a significant part of my country’s history. I wanted to discuss my every thought about the characters, my opinion on the war and just how great of a writer Chimamanda Adichie is. Now after reading 4 books and watching a few interviews and lectures, I am still in awe of this woman. Her words have had a profound impact on me and it makes me see the world in all it’s intricacies in a way I have never done before. I chew in her words like you would do food, savouring every bite and digesting it all. She is one of the few writers whose words, stories and characters I still remember regardless of how many years has gone by. Her public speaking content is superb! Growing up in Nigeria, I learnt most of the things I did about the world through books or the television. Internet was a luxury then, and to a certain extent it still is—you can access it but it takes a bit of time, patience and effort. My point is I didn’t grow up watching YouTube videos. So after moving to England to attend University, I gained the luxury of fast and easily accessible internet. Which also came with the perks you use the internet for. I found “Dangers of a Single Story” video by accident and was actually inclined to watch it because I recognized Chimamanda Adichie’s name. And I must say I was glad I did. The first thing that strikes you about the lecture is the way she speaks. Up until that point, I only knew what she looked like from the cover of her books and knew very little of her as a person. So it was the first time I heard her speak. She spoke eloquently, in a calm manner that draws you into what she is saying. But of course the interesting content is what keeps you listening. As a Nigerian, it was interesting to me to see her use personal experiences from growing up in Nigeria. This may not necessarily be obvious or a “culturally aware” example for her foreign audience, but she explains it in a way that is easy to comprehend. It goes the same with her lectures. With people trying so hard to become “westernized”, It is refreshing to see someone who celebrates her culture. She embraces it and presents it to the world in the most dignified sense. It is definitely admirable. You may have heard of Chimamanda Adichie after an excerpt of the lecture above “We should all be feminist” was played in Beyonce’s song Flawless. I highly recommend you listen to the entire talk. If possible purchase the 52 pages book of which The Guardian’s Rupert Hawksley says “It might just be the most important book you read all year”. Share it with your friends and family and the interweb as well. It is a powerful message about feminism which “whispers rather than shouts and confides rather than chides”. I remember bugging two of my friends in University a few months back to watch the videos above and they were a bit unwilling. However, I was adamant and agreed to watch just one. Later on, they asked to watch the second one without my probing. A reel of the books she has authored! When I think about my teenage years and transitioning from a pre-teen to a young adult, I reminisce with fondness about ‘books’. They were a huge and fundamental element of my life. However there are certain books that are prominent in my memory and all of Chimamanda’s books are on that list. Above are some of her books and the ones I’ve read arranged in order of how I liked them! Speaking of her books, I found her lead characters to possess certain characteristics that I believe women should possess. Strong, independent and comfortable in their truth and opinions. You can tell that she projects her ideals onto the characters who may not necessarily be like her but they carry certain personality traits. I could relate to Ifemelu from Americanah, whose experience was on the other side of the pond from me. But nevertheless represented a Nigerian moving to a foreign land to study, trying to adjust to life abroad. And trying to find herself whilst also trying not to lose herself. I especially remember the decision she made to not to lose her Nigerian accent which was very striking to me. If you notice, most of the Chimamanda books I read were borrowed books, but over the years I have purchased my copies. In the spirit of this piece I have decided to read “Purple Hibiscus”and “Half of a Yellow Sun” again and I will write a review about it. Just to let you know, I haven’t read it since I read them the first time, when I was 13 and 16 respectively. Let me know what you think of Chimamanda and her books in the comments below and don’t forget to read her vogue article.